A 32-year-old man presented with a two-year history of chronic cough and episodes of hemoptysis. He had been previously managed as having pulmonary tuberculosis. 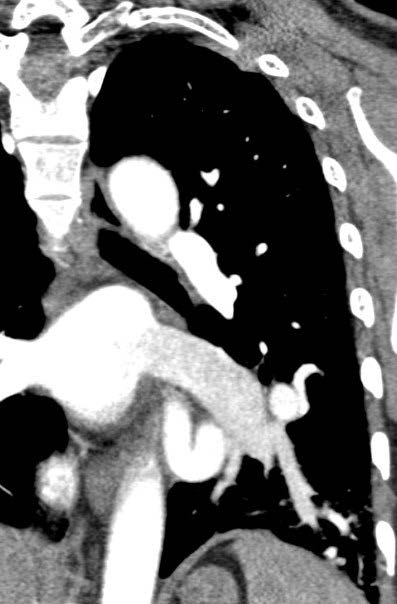 A chest CT was performed at another institution, which revealed a vascular malformation. 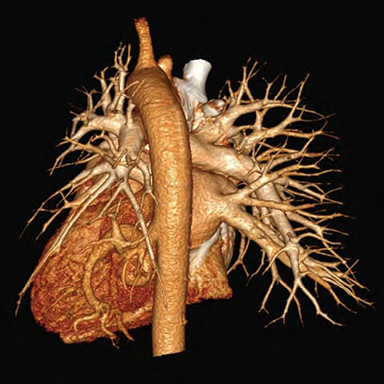 CT angiography of the pulmonary arteries and aorta (Fig.) was advised and subsequently performed at our center. Pulmonary arteriovenous malformations (AVMs) usually present with dyspnea, hemoptysis, cyanosis, or clubbing;they may also be asymptomatic and found incidentally. These lesions are caused by abnormal communication between the pulmonary arteries and veins and occur most frequently in the lower lobes.1,2,5 CT may demonstrate more complex appearances, such as a plexiform mass of dilated vascular channels or with dilated, tortuous direct communication between an anomalous feeding artery and draining vein (nidus). AVMs may be solitary or multiple. Multiple lesions are often associated with hereditary hemorrhagic telangiectasia (HHT), also known as Osler-Weber-Rendu syndrome.1,5 An AVM is excluded in our patient because of the presence of a systemic arterial supply to the left lower lobe and the lack of a definite direct communication between the pulmonary artery and vein. Pulmonary varix refers to an enlargement of a segment of a pulmonary vein without an enlarged feeding artery or nidus. This is typically seen near the left atrium with contiguity with the pulmonary vein. Varices may be congenital or acquired. Patients are usually asymptomatic and generally not treated, but may also present with hemoptysis;hence, surgery may be required.5 Although the left inferior pulmonary vein is prominent in our patient, the presence of a large systemic arterial supply makes this diagnosis unlikely. 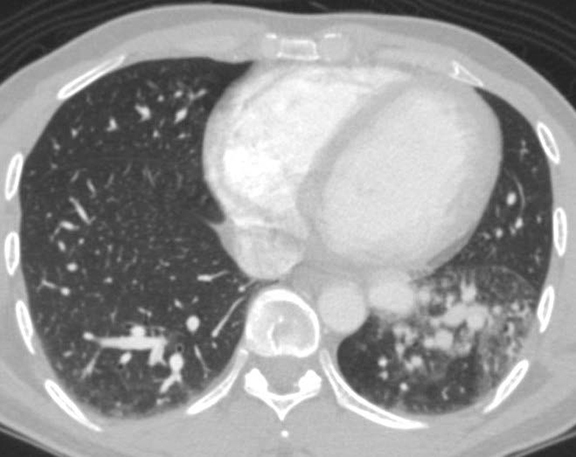 Pulmonary sequestration is characterized by dysplastic, nonfunctioning lung parenchyma that does not communicate with the tracheobronchial tree and has an anomalous systemic arterial supply,1,2,3,4,5 usually from the thoracic or abdominal aorta; arterial supply from the celiac, splenic, intercostal, subclavian, or even coronary arteries is less common.3,4 A sequestration may appear as a persistent opacity or mass. It may be associated with congenital pulmonary airway malformation (CPAM), in which case air may be present within the lesion. Lesions may also contain air when infected. The most common location is within the left lower lobe.1,2,4 Sequestrations can be intralobar (within visceral pleura and venous drainage via the inferior pulmonary vein) or extralobar (separate pleural covering with venous drainage usually via systemic veins, typically the azygous vein and less commonly via the portal, left subclavian, or internal mammary veins).1,2,3,4,5 The imaging findings in our patient are very similar to a pulmonary sequestration, except that the involved lung only shows hyperemia with a normal tracheobronchial tree. Based upon the above-mentioned characteristics, our patient has pulmonary pseudosequestration in the left lower lobe. With the advances in CT having multi-detector technology, the evaluation and diagnosis of congenital bronchopulmonary foregut malformations is greatly enhanced. Thorough and careful assessment of the airway, lung parenchyma, esophagus, arteries, and veins should be systematically analyzed in order to arrive at the correct diagnosis. The treatment plan is dependent in the proper identification of the pulmonary and systemic vessels. In our 32-year-old patient who presented with a two -year history of chronic cough and hemoptysis, CT findings in the left lower lobe of a predominantly systemic arterial supply from the descending thoracic aorta, a small pulmonary arterial supply, a prominent left inferior pulmonary vein draining into the left atrium, and a normal tracheobronchial tree leads to the diagnosis of pulmonary pseudosequestration. Daltro P, Bradley LF, Donnelly LF, et al. CT of Congenital Lung Lesions in Pediatric Patients. AJR 2004;183:1497-1506. Daltro P, Werner H, Gasparetto TD, et al. Congenital Chest Malformations: A Multimodality Approach with Emphasis on Fetal MR Imaging. RadioGraphics 2010;30:385-395. Biyyam DR, Chapman T, Ferguson MR, et al. Congenital Lung Abnormalities: Embryologic Features, Prenatal Diagnosis, and Postnatal Radiologic-Pathologic Correlation. RadioGraphics 2010;30:1721-1738. Newman B. Congenital bronchopulmonary foregut malformations: concepts and controversies. Pediatr Radiol 2006;36:773–791. Lee EY, Boiselle PM, Cleveland RH. Multidetector CT Evaluation of Congenital Lung Anomalies. Radiology 2008;247:632-648. Singh AS, Subbain SK, Subramanian KG, et al. Pseudosequestration of the left lung. Tex Heart Inst J 2007;34(2):195-198. Do KH, Goo JM, Im JG, et al. 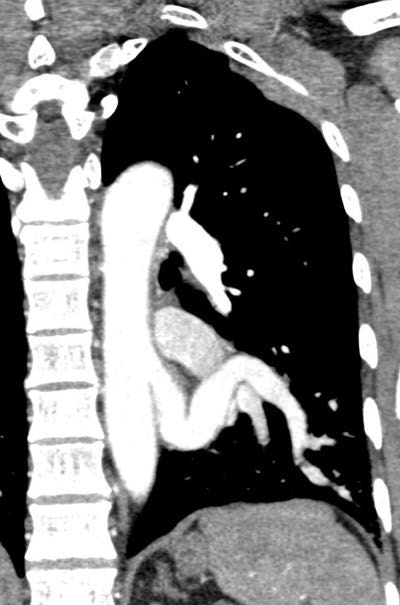 Systemic Arterial Supply to the Lungs in Adults: Spiral CT Findings. RadioGraphics 2001;21:387-402. Yamanaka A, Hirai T, Fujimoto T, et al. Anomalous systemic arterial supply to normal basal segments of the left lower lobe. Ann Thorac Surg 1999;68:332-338. Concepcion NDP, Laya BF, Saulog AM. Pulmonary Vascular Anomaly. J Am Osteopath Coll Radiol. 2014;3(2):25-27. Drs. Concepcion, Laya, and Saulog work with the Institute of Radiology, St. Luke’s Medical Center, Quezon City and Global City, Philippines.